mAadhaar app which is already launched and newly mobile application by Unique Identification Authority of India (UIDAI). This app will help you to carry your Aadhaar profile information on your mobile smartphone. But the question is How to use the mAadhaar app & how to download mAadhar App for smartphone, so below is easy way to know and follow to use mAadhaar App. Note: All users need to have a registered mobile phone number in order to use of it. UIDAI has launched the mAadhaar app which is a mobile application for your smartphone. mAadhaar app will help you to carry your Aadhaar information on your smartphone, like name, address, DOB, photograph which are linked with your unique Aadhaar Card. According to the description provided in the mAadhaar app, users need to have a registered mobile phone number in order to use it. 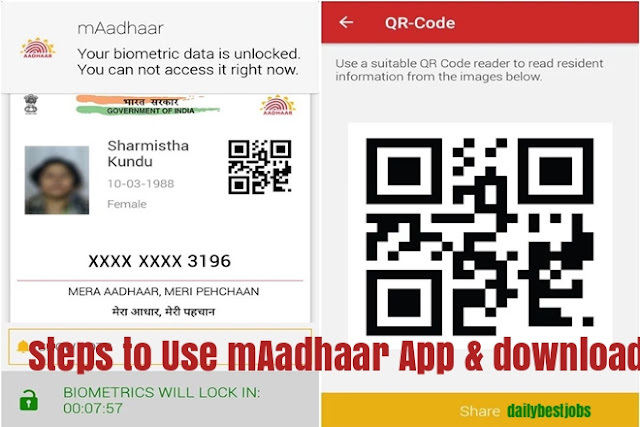 The mAadhaar application can be downloaded from Google Play Store, so Android users can download it right now. However, the app is currently not seen on the Apple iOS, but we can expect a launch quite soon. The number is not a registered digit with UIDAI, you will have to pay a visit to an enrollment centre or a mobile update end point. As mentioned before, users will no longer need to carry the hard copies of their Aadhaar card, once they start using the app. With Aadhaar number holder profile download, you will have a convenient way to carry the unique number with demographic details anywhere. Also, in the app, there is a biometric locking and unlocking system. You can download the app, by going to the Google Play Store on your Android smartphones. Just type ‘mAadhaar’ in the search option. Download and install the first app (by UIDAI) that appears. Meanwhile, Apple device users will have to wait for some time. Before you download the Aadhaar app on your Android phone, you have to make sure the phone number on the smartphone is the same as the one linked to your Aadhaar card. This is the number that you had submitted at the time of getting an Aadhaar card. It will get you an OTP for verification and setting up profiles on the Aadhaar mobile app. If your number is inactive, the verification will not work. Once you open the app, you will be asked to create a password. The password will be highly important so there is a need to keep it safe. This password will be required every time you want to carry out any action on the app. After you have created the password, the next page will make you enter your Aadhaar card data. After this is done, a verification code is sent to your registered mobile number, and your Aadhaar data gets synced. The app will read the verification code on its own. If you have not gone to the UIDAI website to lock your biometrics for Aadhaar, then the app will prompt you to lock these. Do note that once you lock your biometrics, you can’t use these to activate any new service. For instance, if you are setting up a bank account with Aadhaar verification, the biometrics will not work since you’ve locked them. However, in the settings menu, you can unlock these as well. UIDAI wants you Aadhaar detail sharing simply by making you share it from the smartphone. When it comes to security, there is the added measure of entering your password every time you want to do any action on the mAadhaar app. Also, your Aadhaar details maybe at risk if your lose your smartphone. Meanwhile, UIDAI has not really mentioned how it keeps the Aadhaar data secure on this app. Other features include a system of Time-based One-Time Password generation. A TOTP will automatically be generated as a temporary password and that can be used instead of the usual SMS based OTP. Users will also be able to update their profile, after which they can get an updated view of Aadhaar profile data after successful completion of an update request. In order to share details, there is a sharing of QR code and eKYC data by Aadhaar Number holder system. You can share QR code and password protected eKYC data to retrieve accurate demographic information from it instead of manually entering details. Subscribe below for more updates on mAadhaar App, How to Use & Download mAadhaar App For Smartphone.